The following press release is from the June 29th action in West Roxbury, Boston, MA resulting in 23 arrests including Tim DeChristopher and Karenna Gore. Additional photos for media use are available at https://flic.kr/s/aHskDcoQPY. 12 CLERGY ARRESTED AT SYMBOLIC CLIMATE MASS GRAVE FUNERAL TO HALT CONSTRUCTION OF THE WEST ROXBURY LATERAL. West Roxbury, MA – 12 faith leaders and 11 others were arrested this afternoon [June 29, 2016] while peacefully blocking construction of the West Roxbury Lateral pipeline. Buddhist, Jewish, Protestant, and Unitarian clergy led a climate mass graves funeral, featuring eulogies, prayers, and mourning. After the funeral, some clergy and other resisters lay on the side of the trench, halting construction. Others got into the trench and lay down to simulate those who died this month from deadly heat waves in Pakistan and India and were buried in mass graves. The action called attention to how the West Roxbury Lateral, like other new fossil fuel infrastructure, further locks us into deadly global climate change. As more studies point to the high rates of leaked methane from fracking and gas pipelines, the climate movement has doubled down on resistance to new fracked gas projects. Among those lying in the trench was Karenna Gore, daughter of Vice President Al Gore and director of the Center for Earth Ethics at the Union Theological Seminary. She is the mother of three and came to join the action from her home in New York City. Also lying in the trench was Tim DeChristopher, the climate activist who became famous as Bidder 70 when he disrupted a government oil and gas lease auction by posing as a buyer in the sale during 2008. He served 21 months in federal prison and his probation ended this past April. This was his first act of civil disobedience since 2008. “This is the age of anticipatory mass graves, and this pipeline trench is our anticipatory mass grave,” said Tim during a speech before being arrested. 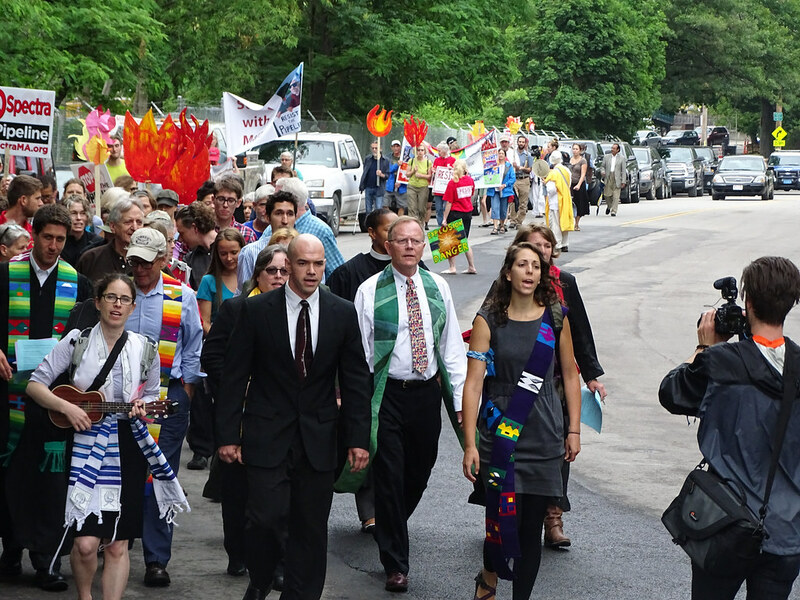 Many of the participating clergy previously took action on May 25 when 16 faith leaders led a prayer service at the edge of the pipeline trench. They were arrested for trespassing and disturbing the peace and will appear in court for a summons later this summer. The City of Boston is still fighting in court to stop the West Roxbury Lateral pipeline, but construction is ongoing, authorized by the Federal Energy Regulatory Commission (FERC). Boston Mayor Marty Walsh, all members of the Boston City Council, their elected leaders on Beacon Hill, US Congressman Steven Lynch, as well as US Senators Elizabeth Warren and Ed Markey oppose the construction of the West Roxbury Lateral pipeline. "People around here talk about cracks in the foundations of their homes from the blasting quarry. And now there is a pipeline here, right next to the quarry. The incineration zone is 30 blocks on either side of the pipeline. How are we supposed to protect ourselves?" So powerful. Thank you for the extreme effort and hopefully the extreme results. You rock! !